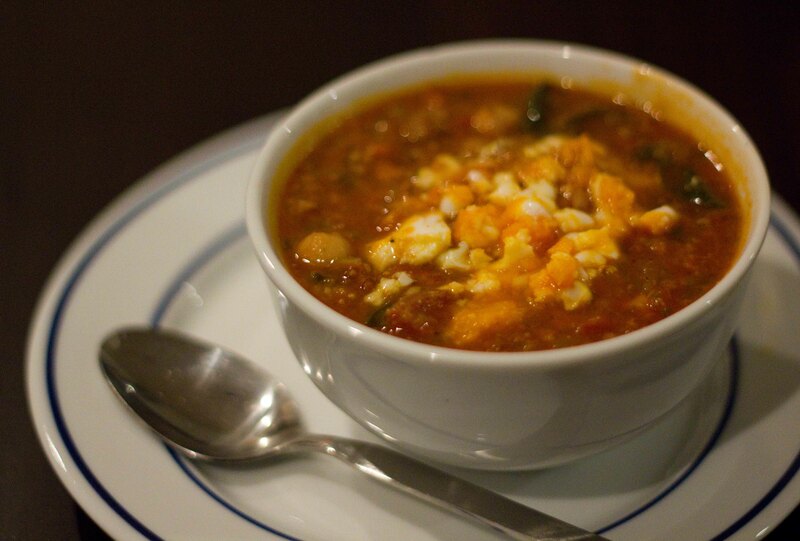 I woke up this morning thinking about chorizo and chickpea soup. It was a cold morning, so it wasn’t unusual for me to crave soup and I thought that the smokiness of the chorizo and the heartiness of the chickpeas would be the perfect combination. I knew I’d seen a recipe for this in one of my cookbooks, so I started the hunt. I narrowed it down to Jamie Oliver, but couldn’t remember which one. I spent the morning drinking coffee looking through every single JO cookbook until I finally found the recipe. In January, my Monday routine has to change as Granville Island Public Market is closed on Mondays in January. I decided that Whole Foods would have everything I needed, but soon discovered that they don’t sell chorizo there. I panicked a bit because I didn’t think that a regular supermarket was going to have a chorizo good enough to be the star of my soup. I thought of holding off until tomorrow when I could go down to Oyama in the market to pick up a beautiful piece of chorizo. But there’s something about cravings, they can’t be put off until tomorrow. So I went to another supermarket and picked up 2 kinds of chorizo, thinking that what I may have lacked in quality, I was going to make up for in abundance. The funny thing is, I thought I’ve made this soup once before. What I’ve come to realize is that I haven’t, nor have I ever eaten a chorizo and chickpea soup before. I have looked at the photo in the cook book enough times that its perceived deliciousness has been ingrained into my memory. I guess that’s the power of good photography. 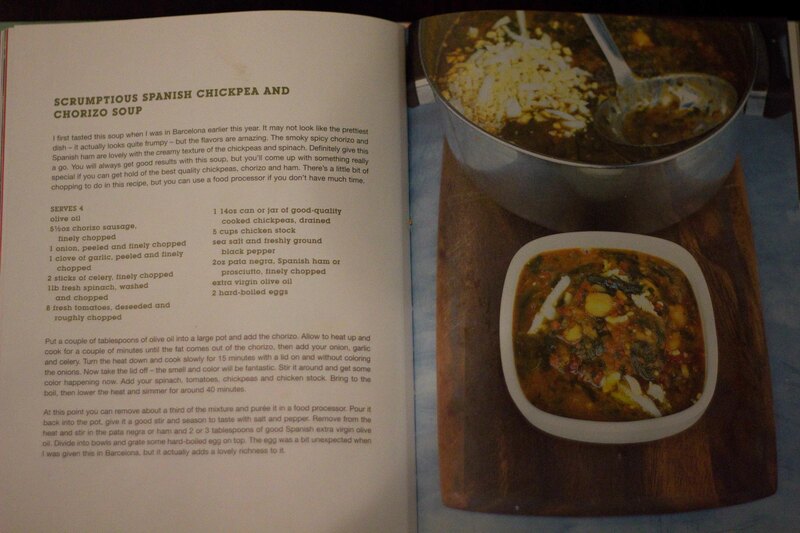 Jamie Oliver’s cookbook, Jamie’s Dinners. Click on the photo if you want the recipe. I modified the recipe a bit, using canned diced tomatoes and putting half a carrot in with the celery and onions because I think every soup should have a bit of carrot in it. After blending half of it and letting it sit a while, it felt like it needed “something”. I had Ben try it, and he his opinion was that it was “good, not great”. Well, good is not good enough for me, so I fried up the one last chorizo I had on-hand and added a tablespoon of sweet paprika to the pan. I added some of the liquid from the soup and let it all cook down for a bit. I added all of this to the soup and let it simmer for a bit longer. The result? Great. Mmmm soup looks great – did you have any leftovers? Do you think it would have been great the first time around if you found your perfect chorizo or if you used fresh tomatoes instead?? Maybe it would have been better if I used better chorizo. The ones you can get at Oyama have way more flavour than the ones I got. Don’t think the tomatoes would have made a difference. And yup, lots of leftovers!